Practice Fusion is the fastest-growing healthcare platform in the US. Its mission is to connect doctors, patients, and data to promote better health and save lives. A driving force in modernizing American healthcare, Practice Fusion is used by over 112,000 monthly active medical professionals who serve 75 million patients. Practice Fusion develops a series of products including both physician-facing apps and patient-facing apps. Their core product is currently the number one cloud-based electronic health record (EHR) platform in the U.S. Matt Douglass, co-founder and SVP Customer Experience, credits the company’s success to fully embracing the cloud to connect doctors to more than 70,000 pharmacies and 600 labs, imaging centers, and billing partners across the country. Recognizing the complexities involved in managing a medical practice, Practice Fusion developed more than 100 features to help physicians run their business by simplifying tasks such as managing patients’ diagnoses, ordering labs, and managing superbills. Practice Fusion’s user base consists of physicians, practitioners, nurses, billers, and transcriptionists. Due to the wide range of daily users, the app must excel in a variety of areas depending on the needs of its users. While simplifying things for users, the product team at Practice Fusion encountered a challenge of their own: simplifying the process for accepting, organizing, and prioritizing user feedback and turning it into actionable insight. The Practice Fusion product team tried to manage this by merging ideas but found this caused anger among some users who felt like their ideas were being removed. In addition, Practice Fusion did not have the ability to pre-moderate their feedback forums, which was a concern since they deal with sensitive medical data. Understanding the significance of being able to efficiently listen and respond to their users while maintaining a level of security, Douglass found a solution with UserVoice. UserVoice is now a core component of Practice Fusion’s strategy for gathering feedback and prioritizing feature requests. According to Douglass, UserVoice not only allowed pre-moderation, but also “helps us decide what to build and how to build it to best meet our customers’ complex needs,” says Douglass. UserVoice has enabled the product team to zero in on the top user-requested ideas. Submitted ideas are a starting point for features they plan on building and, combined with their own user research, the product team builds out the details of how that idea will materialize into a feature. Practice Fusion’s product team feels lucky to have an opinionated and vocal community. “The worst thing would be to have silent customers that don’t help with improving the product,” Douglass says. Their product team has received many valuable contributions from customers and about 40% of their users have created ideas, added comments, or voted. UserVoice is a communication channel available to all of Practice Fusion’s customers so it allows other users, besides physicians, to have the opportunity to voice their opinions. 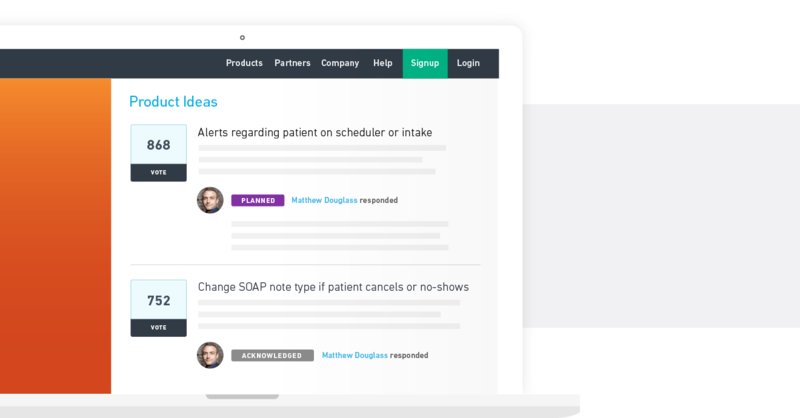 A lot of feedback actually comes from front office staff and nurses, who act as the engine that makes the office run, and through UserVoice, they have a channel to help influence a product they use throughout the day to help their practice succeed. Since adopting UserVoice in 2015, Practice Fusion’s product team has already tackled 60 user-initiated product requests and plans to continue building customer-requested features. “We will continue to listen to our customers for features they want and as we’re building out our 2016 roadmap, we are purposefully leaving space for dozens of major features that will all come directly from customers submitting and commenting via UserVoice.” says Douglass.